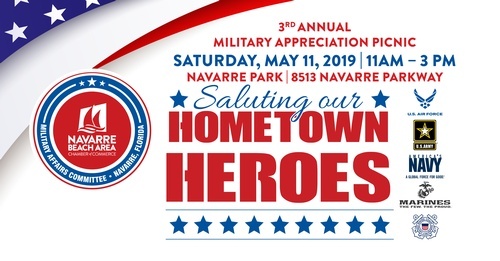 The Navarre Chamber will host the 3rd Annual Military Appreciation Picnic "Saluting Our Hometown Heroes" on Saturday, May 11, 2019, from 11 am to 3 pm in Navarre Park, 8543 Navarre Parkway. If you are interested in helping organize and plan for this popular community event, please make plans to attend the 1st 2019 Picnic Planning Session on Tuesday, February 12 at 4 pm at the Chamber Office, 2053 Fountain Professional Court, Suite A. The Military Appreciation Picnic will be dedicated to honor, remember, recognize and appreciate those who have served and those now serving. All service members and their family are invited to enjoy a efree day of food, fun, games, fellowship and live music. The Navarre Chamber Military Affairs Committee is seeking sponsorships, volunteers, door prize donations and goody bag items for this wonderful event as it feeds, entertains and shows appreciation for military members and their families in the Navarre area. For information on how you can get involved or arrange a pick-up of your donation items, call Picnic Chair: Diane Waschenko/Coldwell Banker Residential Real Estate at 914.447.5847. The Navarre Chamber Military Affairs Committee (MAC) is a group of Navarre Chamber Members who volunteer service to the military through support of the military mission and enhancement of the relationship between the community and the military.